Mossdale Caverns is a cave system where Mossdale Beck disappears below ground into the caves at Mossdale Scar. The caverns are carved from Yoredale limestone by the flow of Mossdale Beck which is the largest stream sink in England. The very challenging 6.5 mile cave system is graded V, super severe, because it involves crawling and squeezing for most of its length and the passages are narrow and often muddy, with many submerged or semi-submerged sections. The caverns can, and does, flood completely after even a small amount of rainfall. The cave system is located on private property and permission to enter the caves is no longer granted due to the tragedy that happened on 24th June 1967 when ten young cavers aged between 17 and 26 years entered the cave system. After three hours four of them decided not to continue and exited the caves. One of these four returned to the entrance shortly afterwards to find it completely flooded due to a recent rainfall swelling Mossdale Beck. Immediately realising the danger of the other six cavers inside she ran 2.5 miles across the moor to raise the alarm. When the Upper Wharfedale Fell and Cave Rescue teams arrived the high water levels prevented them access so the waters of Mossdale Beck had to be diverted away from the cave entrance by digging a trench and still the rescue operation could not begin because of the high internal water levels. It was not possible to enter the caves until the following day. The Cave Rescue teams found five of the bodies in the Far Marathon Crawls and the sixth was found the following day. The bodies were left as found and in 1971 they were buried by their colleagues from the ULSA in “The Sanctuary” a chamber in High Level Mud Caverns with the agreement of their families and concrete was poured down to seal the entrance but was later opened up again. There is a metal tablet fixed to the rocks at the safe entrance in everlasting memory from their families and is to date the single most deadly tragedy in British caving. There is also a poem in memory of the cavers written by Oliver Pratt of Grassington and is placed in the Church of St. Mary in Conistone. We park at the side of the road at the stone arched Conistone Bridge and walk forwards into the village where we turn left and immediately right on a stony track and keep bearing right to go through a gate. We head forwards and walk uphill through the narrow gorge of The Dib. At the top it opens out into a valley for a short way and we go through two gates before we start to go uphill again following the track. We go through a gate and scramble up some rocks. At the top we make our way to go through a gate and turn left through another gate then turn right following the public bridleway sign for Sandy Gate. We follow the track though a gate and then between two walls and at the crossroads we turn left following the sign post for Capplestone Gate and head forwards to a tree plantation where we turn right with the trees on our left. 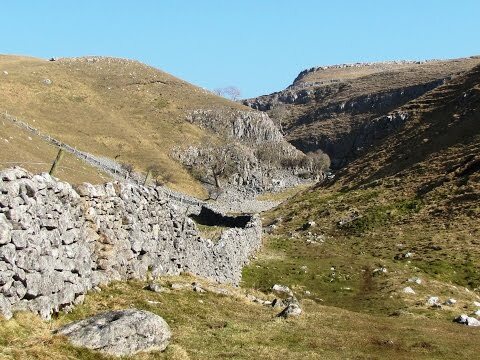 We follow the path with the wall on our right and then bear left across the open field, Mossdale Scar and the caverns are clearly seen on the right. We go through a wall and keep heading uphill following the track to a gate (Capplestone Gate). We go over the ladder stile and turn left and head forwards with the wall on our left. When we reach a sign post we head forwards along the top, not left for Kettlewell. We go through a gate and after a short way we turn left over a stile in the wall. We now head downhill following the path with a wall on our right we go through a broken wall and keep heading downhill and through a gate in the wall on our right towards the bottom of the wood. We now turn left onto the Dales Way and keep heading forwards over the stiles and then to the left of Conistone Pie. When we get level with the outcrop of Conistone Pie we go over the stile in the wall on the left and head forwards following the path until we come to a wall. This is the top of The Dib where we came up but we turn right and follow the track, Scot Gate Lane, all the way to a tarmac road and then turn left. We visit St. Mary’s Church to view the plaque in memory to the lads that died in Mossdale Caverns then continue into Conistone and back to the bridge. This is a moderate to hard walk on grass and stony tracks and public footpaths. There are some steep inclines and declines and one short rocky climb. Elevation: lowest point 183.30 metres (601.38 feet) highest point 514.70 metres (1685.65 feet). Approx 7 miles allow 3 hours using OS map OL2, Yorkshire Dales, Southern and Western Areas. Conistone is just off the B6160 between Grassington and Kettlewell in Upper Wharfedale in the Yorkshire Dales. From the A1 take the A61 to Ripon. At Ripon take the B6265 through Risplith and Pateley Bridge, past Hebden and Grassington. At the t-junction at Threshfield turn right onto the B6160. After about 2.5 miles Conistone is on the right just before Kilnsey. There are no public toilets, pubs or shops in Conistone. The nearest pub, the Tennant Arms, is at nearby Kilnsey. There are pubs, cafes and shops at Grassington and Kettlewell.